"Wallace and Gromit are arguably the two most delightful characters in the history of animation. Between the previous sentence and this one I paused thoughtfully and stared into space and thought of all of the other animated characters I have ever met, and I gave full points to Bugs Bunny and high marks to Little Nemo and a fond nod to Goofy, and returned to the page convinced that, yes, Wallace and Gromit are in a category of their own. To know them is to enter a universe of boundless optimism, in which two creatures who are perfectly suited to each other venture out every morning to make the world into a safer place for the gentle, the good and the funny. "Wallace is an inventor. Gromit is a dog, although the traditional human-dog relationship is reversed in that Gromit usually has to clean up Wallace's messes. No, not those kinds of messes. They're not that kind of movie. In three short subjects and now in their first feature, Wallace sails out bravely do to great but reckless deeds, and Gromit takes the role of adult guardian." "I hope you will forgive me for saying so -- and I hope the filmmakers will forgive me, too -- but "Wallace and Gromit: The Curse of the Were-Rabbit" has forced me to ponder the deepest mysteries of cinema. Why, for instance, do certain faces haunt and move us as they do? "I am thinking of Gromit, the mute and loyal animated dog whose selflessness and intelligence can be counted on, when things get really crazy, to save the day. Gromit has no mouth, and yet his face is one of the most expressive ever committed to the screen. In particular, his brow -- a protuberance overhanging his spherical, googly eyes -- is an almost unmatched register of emotion. Resignation, worry, tenderness and disgust all come alive in that plasticine nub. To keep matters within the DreamWorks menagerie, you might compare Gromit to Shrek, who has the genetic advantages of Mike Myers's Scots burr, a bevy of celebrity-voiced sidekicks and rivals, and state-of-the-art computer-animation technology. Good for him. But Gromit, made by hand and animated by a painstaking stop-motion process, has something Shrek will never acquire in a hundred sequels: a soul. "And this unassuming pooch's feature film debut, after appearances in three sublime half-hour shorts, is thus a solemn occasion (even if the movie itself is utterly silly). His face now enters the pantheon of stars whose charisma transcends speech. Keaton, Chaplin, Garbo -- let them now make room for Gromit. Which is in no way to slight Wallace, his entrepreneurial owner, who speaks in the voice of Peter Sallis and who personifies all the traditional virtues of the provincial English middle class. (His shortcomings are entirely his own, of course.)" I remember being slightly disappointed with this one in that the obvious plot twist turned out to be the actual plot twist and not a deliberately lampshaded red herring. Still, one doesn't watch Wallace and Gromit for the plot. We've gotten our three-year-old into the shorts so far. (His attention span isn't quite up to full-length movies yet; he tends to wander off in the middle, although he has a keen sense of when his favorite scenes will show up and can return in time for them.) I am encouraged that he requests them regularly and refers to them simply as "Gromit." As in, "Daddy, can we watch some Gromit now?" The Wrong Trousers will always be the high point of W+G for me: perfect length, perfect plot, and incredibly filmic in the way its shots are composed and lit -- it always seemed to be a trial-run for a full-length feature. In a perfect world, Wallace and Gromit would have been the ones to get a weekly series. 6-12 half hours of Wrong Trousers-styles greatness, and done. Everything about The Wrong Trousers seems like a truly awesome pilot episode. It feels like there must be a full Wallace and Gromit series in one of those Fringe-style alt universes where Eric Stoltz starred in Back to the Future and stuff. Jesus, a quick Googling reveals that The Wrong Trousers is 22 freaking years old. Yeah, the Wrong Trousers is everyone's favorite, even the aforementioned three-year-old. He likes to get my big old boots out and stomp around in them shouting that they are "the trousers, Daddy, help help." This movie happened to come out right after I met the man who is now my husband. We were both geeky, awkward young'n's, and I had a crush on him a mile long. One night, we got to talking and we both realized we were interested in The Curse of the Were Rabbit, and it was like serendipity! We would go! Right then! To see this movie! Together! (!!!) So we ran off to the movie theater before we realized that it was almost 10pm. We had missed the last showing. Disappointed but not willing to give up on this opportunity for togetherness, we saw a showing of Serenity instead. It was great, and we agreed we would go and see The Curse of the Were Rabbit some other time. That was Thursday night. Friday, my best friend flew in for a visit, and she was interested in The Curse of the Were Rabbit. I thought about it and decided: given my love of Wallace and Gromit, I would be happy to see it twice, so.... I went with my friend to see it. I enjoyed it! When I ran into my now-husband on Monday, I was all about to say, "Hey, I happened to have a chance to see it, and it was great, so let's go!" But I never got it out because before I could, he said, "Hey, so I spent all weekend thinking about going to go see it with you!" And then I felt too guilty to say anything. I didn't want to spoil that excitement. I didn't want to appear any less excited for the opportunity to see it with him. So, I pretended. I responded like I hadn't seen it. All throughout the showing and after, I acted like that it was my first time seeing it. And I kept up with it, this lie of omission, for nine whole years. For nine years, my relationship with my husband was built upon a mound of lies and deceit, all about the Curse of the Were Rabbit. When I finally told him about it, he laughed. 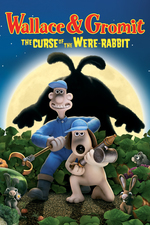 And we got to talking about how much we enjoyed Curse of the Were Rabbit, although we wouldn't rank it as highly as the earlier Wallace and Gromit cartoons. I liked the film, but I didn't think the ending quite worked, for a number of reasons. What was frustrating was going on to watch the bonus features on the DVD and finding that an earlier draft had an ending that was perfect and addressed every single one of my quibbles... and the creators went on about how it would have been such a shame if they'd gone with that version and not fixed it. All I can say is, they were wrong wrong wrong. Still, fun movie on the whole. Shmuel, don't leave us hanging, what was the original ending? I felt that (a) Wallace losing the rabbit ears violated what passed for the story's internal logic, (b) Gromit getting the award at the same time that Wallace returned stripped it of any meaning, (c) Hutch still having some of Wallace's mind was just creepy, and (d) the big rabbit sanctuary thing both undermined the Pest-O mission and was too big an ending for a film about a man who likes cheese and his faithful canine companion. By contrast, the earlier ending (a) had Wallace keep the ears until going back through the Mind-O-Matic, (b) gave Gromit the award in a separate scene, where it could be appreciated, especially with him putting it on the trophy shelf, (c) restored Hutch to full rabbithood, and (d) ended with a nice domestic cheese joke, bringing the dynamic back where it belonged.